KIEV, Ukraine -- When President Viktor F. Yanukovych returns to work on Monday after a four-day sick leave, he will find that even after that brief absence his options for resolving Ukraine’s political crisis have already narrowed. 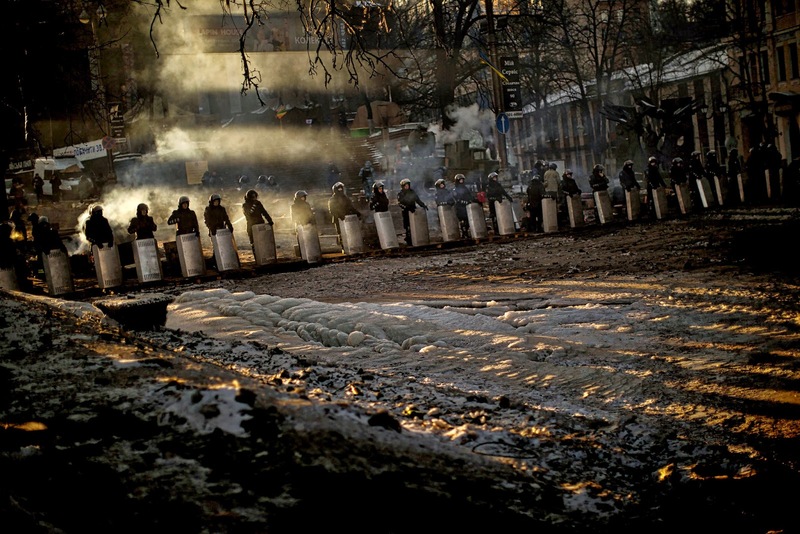 Riot police officers stand guard on Sunday outside Independence Square in Kiev. Opposition protests have entered a third month. His choice may now be between an inevitably bloody suppression of antigovernment protesters or a surrender of authority that could leave him as president but empower his opponents to chart a pro-European course. Mr. Yanukovych, who has faced a sustained civil uprising since late November, when he backed away from a promise to sign political and free-trade accords with the European Union, has seen his position erode substantially in recent days. On Sunday, tens of thousands of demonstrators gathered in Independence Square here in the capital, highlighting that simply suppressing the protests was not enough, and that they were not letting up even after violent clashes with the police led to several deaths and hundreds of injuries. Rather than being placated by any of the concessions, the opposition has grown emboldened by the evidence that Mr. Yanukovych’s position has weakened. There have been reports that some military officers have been asked to sign pledges of loyalty to the president or resign — a sign of uncertainty about their willingness to enforce a state of emergency and move against the protesters should he ever give that order. After attending a security conference on Saturday in Munich, where they were embraced by Western officials, opposition leaders told the crowd in the square on Sunday that they would not accept any compromise that did not give them full control of the government, including the Interior Ministry, which oversees the riot police and other security troops. “There is one way out,” Vitali Klitschko, the former champion boxer who leads a party called the Ukrainian Democratic Alliance for Reform, told the crowd. “To cut this knot, we need a full reset of power and this system. “Yes?” Mr. Klitschko asked. “Yes!” the people roared back. The demonstrators reflected a broad mix of Ukrainian society, including parents towing children by the hand, past photographs of dead demonstrators displayed on makeshift shrines, as well as some of the tough young men — many of them members of right-wing groups — who have shown a willingness to battle the police on Kiev’s streets. Though large, the turnout was far lower than at the movement’s peak in early December, when more than 100,000 people gathered on three successive Sundays. Still, the diversity of the crowd demonstrated the extent to which the opposition to Mr. Yanukovych has hardened across many segments of Ukrainian society. It also helped explain why street protests have spread to regional capitals in eastern Ukraine, long the president’s base of political support. “I admire peaceful protest, but when it comes to violence I understand it, too, and support it, as a manifestation of the people’s will,” Pavlo Bezsmertnyi, 45, a freelance translator, said of his decision to attend the rally despite the threat of violence. At various points, the protests had seemed about to fizzle out, only to be inflamed again as a result of missteps by Mr. Yanukovych’s government. The first of those was a violent crackdown by the police on peaceful protesters on Nov. 30, which caused widespread outrage. Ukraine’s post-Soviet identity had been defined by peaceful dissent, and many said they were stunned the government had resorted to force. “They decided to show the population of Ukraine a lesson that they would remember forever,” said Yaroslav Pylynskyi, director of the Kiev office of the Kennan Institute, an American research organization. Even after the outrage over police beatings led to the occupation of Independence Square and several public buildings, including Kiev’s City Hall, much of the oxygen went out of the protests when Mr. Yanukovych secured the $15 billion financial rescue package from Russia in mid-December. With no economic or political pressure to force Mr. Yanukovych to change course, and with the holidays near, the crowds dwindled. Opposition leaders said they planned to turn their focus to the next presidential election, which seemed the only opportunity to force change in the government. Then, on Jan. 16, the government overreached again. Allies of Mr. Yanukovych in Parliament returned from the holiday break and pushed through a raft of laws restricting dissent. Again the crowds surged into the street, but this time the protests turned violent as demonstrators hurled rocks and fire bombs at the police, and set police buses on fire. While Parliament repealed those laws in yet another conciliatory gesture, opposition leaders said they would now accept only a political surrender by Mr. Yanukovych that was complete enough for them to renegotiate the accords with Europe that he abandoned in November, and to seek a new financial aid package from the International Monetary Fund that would replace the aid from Moscow. At the Munich conference on Sunday, the European Union’s foreign policy chief, Catherine Ashton, confirmed in an interview with The Wall Street Journal that Europe and the United States were developing a sizable short-term aid package for Ukraine, in anticipation of longer-term assistance from the I.M.F. down the line. Mr. Yanukovych had resisted aid from the fund in part because of conditions that included politically painful austerity measures. Western officials voiced concern at the conference about evidence of abductions and abuse of Ukrainian protest leaders by the authorities or their surrogates, including some cases of alleged torture. One victim, Dmytro Bulatov, who had been missing for a week, was found on Friday. He had been beaten severely and said he had been “crucified” by having his hands nailed to a door. On Sunday, Petro Poroshenko, a member of Parliament, a wealthy businessman and a supporter of the Ukrainian opposition, posted on Facebook that Mr. Bulatov, who had been threatened with arrest, had left Ukraine for further medical treatment. In a speech at Sunday’s rally, Arseniy P. Yatsenyuk, the leader in Parliament of the opposition Fatherland Party, called on the president to relinquish the entire cabinet to the opposition and agree to constitutional amendments that would weaken the presidency. Mr. Yatsenyuk, who turned down Mr. Yanukovych’s offer to become prime minister, said the president’s time was limited. “Enough. We’re fed up,” he told the crowd.